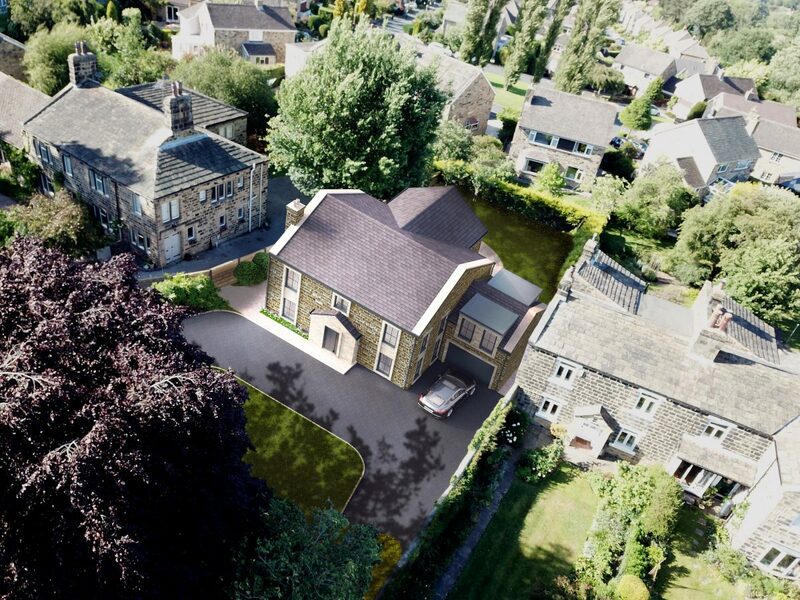 Bowman Riley has designed Willow House, a new five-bedroom detached property on the Main Street of the desirable West Yorkshire village of Menston. Our design approach has been to create a bespoke new family home that combines Georgian features with a sleek modern twist. The front facade with its long Georgian windows and symmetrical proportions will be built in punched face blackened stone to be in keeping with the existing street scene. Aluminium cladding and zinc at the rear provide a more contemporary aesthetic featuring a frameless glazed box protruding into the back garden. Willow House will provide a high standard of living with quality finishes and interesting features including a striking entranceway made entirely with smooth-faced ashlar stone and a recessed balcony to the master bedroom. Located on brownfield land on the site of a former annex building to the original farmhouse, the new property is a narrow slither of land with various restrictions. Our challenge was to create a five bedroom property with driveway and garage ensuring positive views from all habitable rooms. The placement of the building included working around an agreed zone on the site that the building footprint could not cross. We had to manage window to window distances between the neighboring plot with narrow conditions. We retained as much of the existing trees and plants on the site as possible, making sure not to interfere with the identified root protection zones whilst providing a generously sized driveway for three cars with turning head and garage. This commision for Bankhead Group followed the successful completion of Westbourne Drive in Menston. 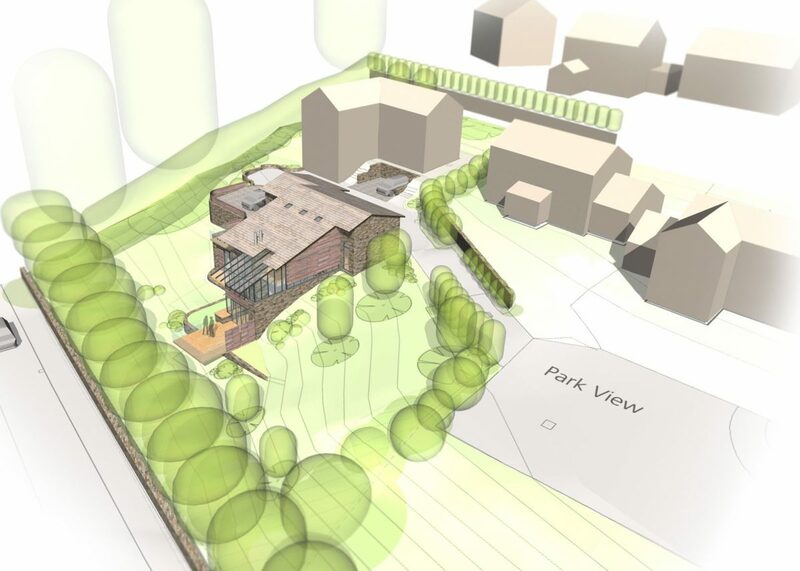 Bowman Riley has designed a new detached family house on 0.296 acres of land to the rear of 20 Victoria Avenue currently occupied by a garden in Westbourne Drive, Menston. Spanning over three storeys, the new home will comprise four/five bedrooms with three en-suites. A study and semi-open plan kitchen/lounge area will have a full height exposed pitch roof on the top floor, so that a generous internal head height can be provided whilst also remaining appropriate within the context of its neighbours. An internal lift provides easy access to all floors. The proposal takes advantage of the level change across the site by integrating a contemporary plan into the design proposal. The ridge height remains consistent with its neighbours and remains subservient to the original properties on Victoria Avenue. 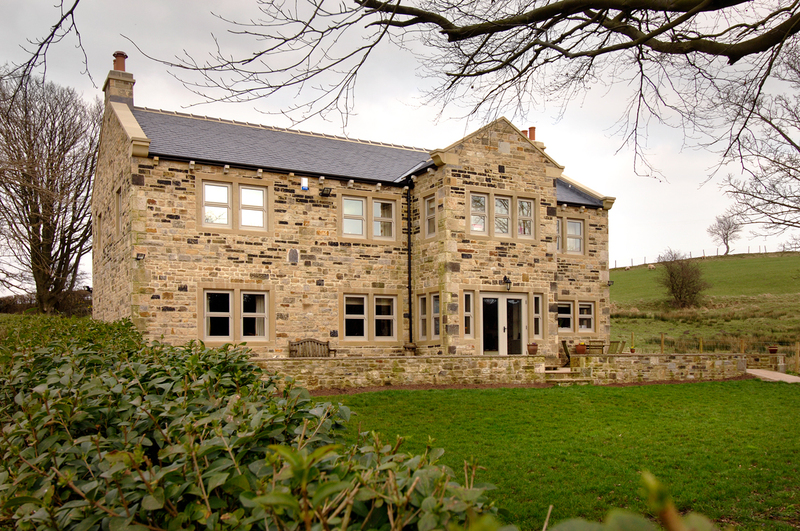 The design retains the existing established stone wall to front of the property. 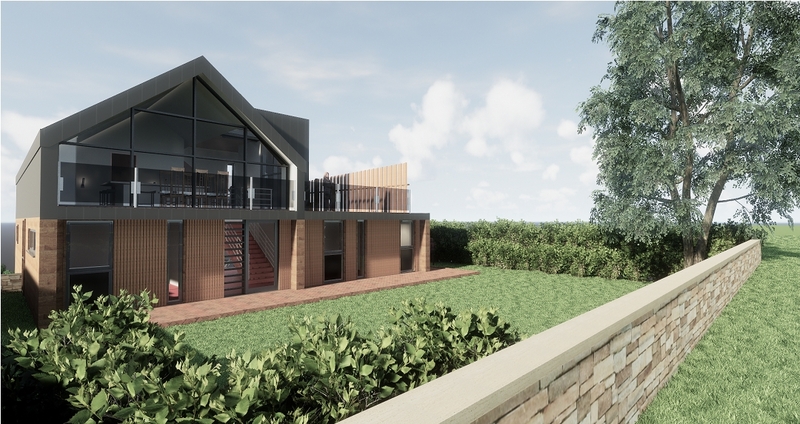 The design maximises the views from all bedrooms, with the master bedroom overlooking the Yorkshire countryside. On the first floor, additional amenity space is provided in the form of a roof terrace. A full height south facing curtain wall helps to maximise natural light. 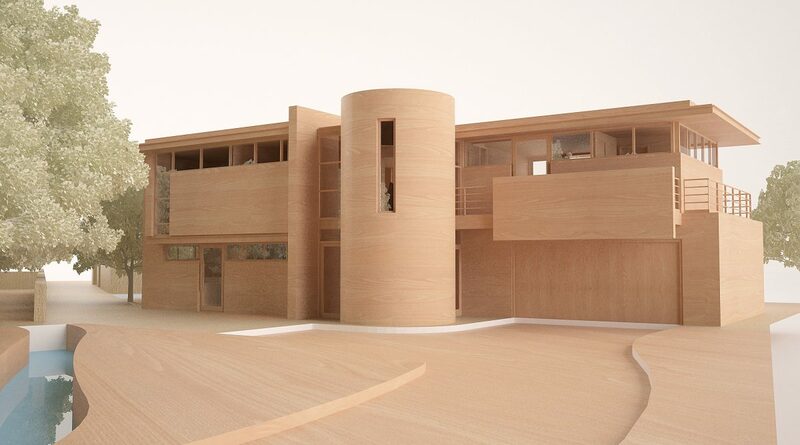 The design has received planning consent. 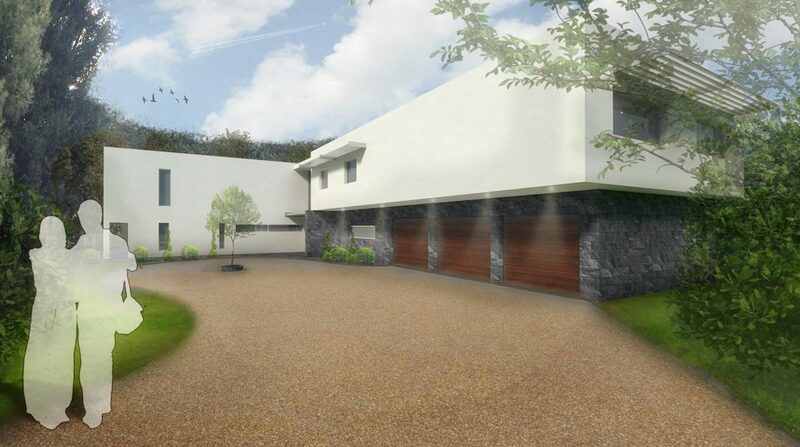 Bowman Riley was approached to design a new contemporary detached home within the grounds of an existing plot in Yorkshire. The clients brief was very specific in their requirement for a contemporary design that reflected their modern lifestyle. Following careful analysis of the existing site, Bowman Riley designed a unique contemporary dwelling that both respected the historical features of the existing site while providing modern, open plan living that reflected the client’s aspirations. The accommodation was provided over two storeys with a low profile, overhanging roof that allowed the new house to fit sensitively within its open countryside setting. 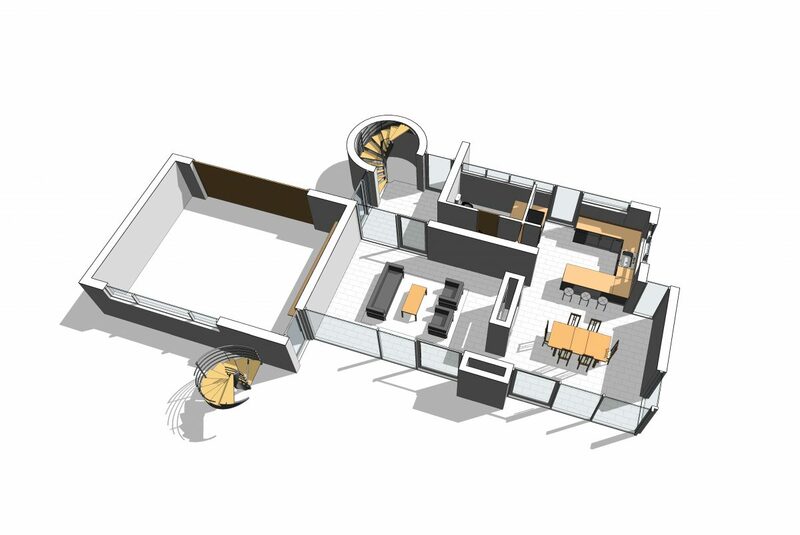 A feature cylindrical tower, containing the main circular stair, marked the entrance to the house and represented a modern reinterpretation of the traditional turret found in many of the historic buildings within the surrounding context. To the ground floor, a large double height living area provided views over the open countryside beyond, with a feature double-sided fireplace connecting to the open plan kitchen dinner opposite. On the first floor, views were again provided from an internal balcony over the main living space and out to the dramatic external landscape. Private masters quarters were provided off to one half of the upper floor with ensuite bathroom, dressing room, and access to an external terrace. A further two double bedrooms and house bathroom completed the first-floor accommodation. 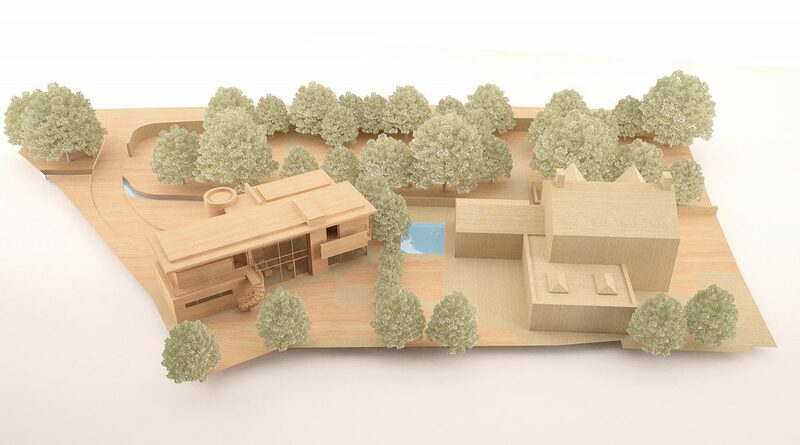 Bowman Riley prepared a detailed concept design for a new luxury house on a private road in London. 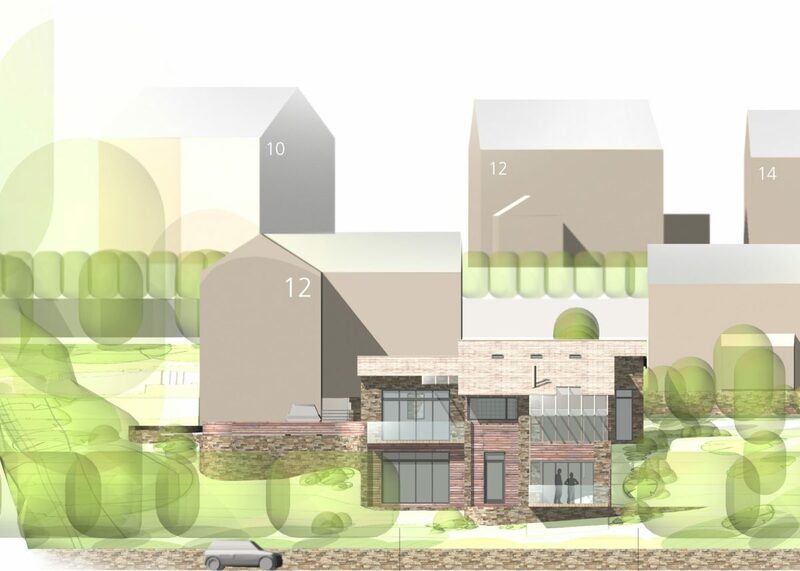 An existing residential property was purchased on a 0.389 of an acre site with the intention of demolishing it to make way for a larger property of up to 7000sqm. The client requested designs for a large contemporary style residence along with an alternative option for a traditional architectural styled house. 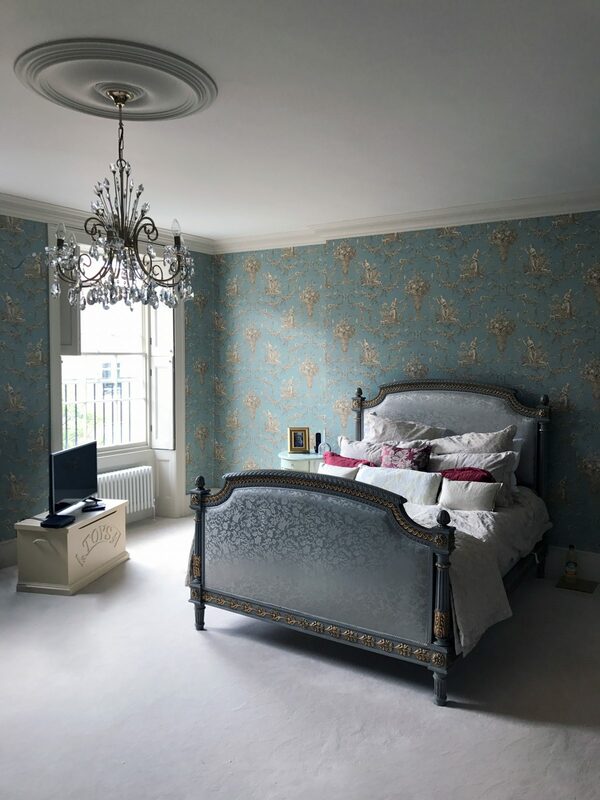 The design process involved research into the high end London residential market focusing on unique architectural properties. 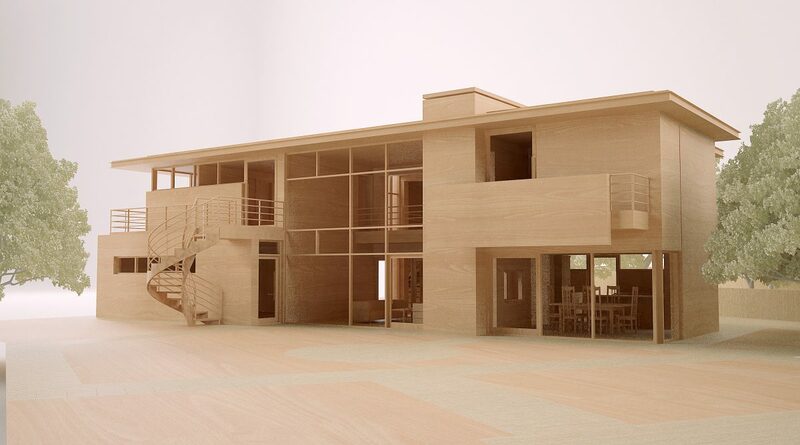 The design evolved around a simple palette of materials and finishes whilst maximising the existing plot and the proposed orientation of the building. 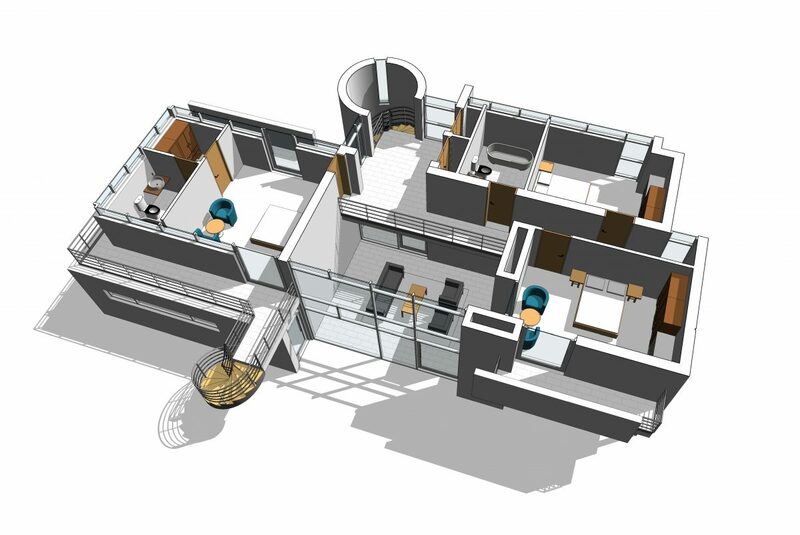 Key features of the interior would be a double height galleried entrance hall and landing. Large open plan living, dining and entertaining spaces overlooking the landscaped gardens. An east wing would contain a triple garage with potential guest and staff facilities and utility functions. We developed a full 3D concept model to generate specific views with which to present to the client within an aspirational brochure format. We developed a look and feel that would provide the high standards for a property of this status and location providing very high levels of quality, finish and appearance. 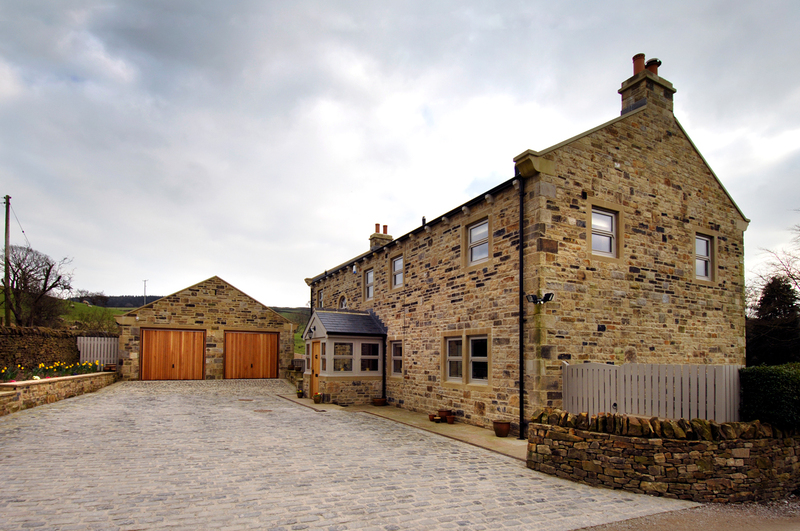 Bowman Riley designed a new build four bedroom detached stone family home in the Skipton, North Yorkshire for a private client. 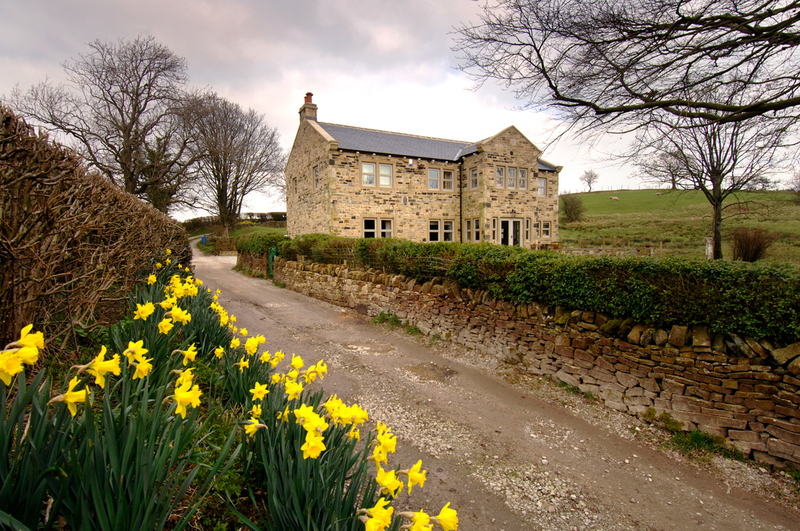 The client purchased a house in a desirable rural location with picturesque views. The client loved the plot and position of the house but not the property itself. 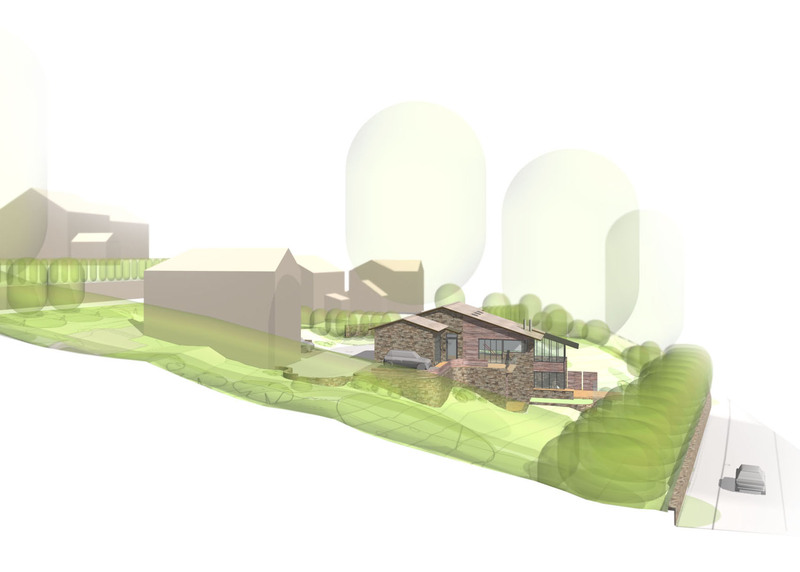 We worked closely with the client to achieve planning consent for a new home. Our strategy involved submitting an initial application for an extension and be re-clad in stone. We then applied for a new build to the specification of the previous application, so the drawings were the same and would not be refused. The budget-led project was a collaborative design and build development. We took into account the difficulty in accessing the site using tight country roads when specifying the building materials. The sustainable elements of the project included air source heat pumps and was high levels of insulation. Good levels of acoustics were requested by the client and were achieved by using concrete flooring. 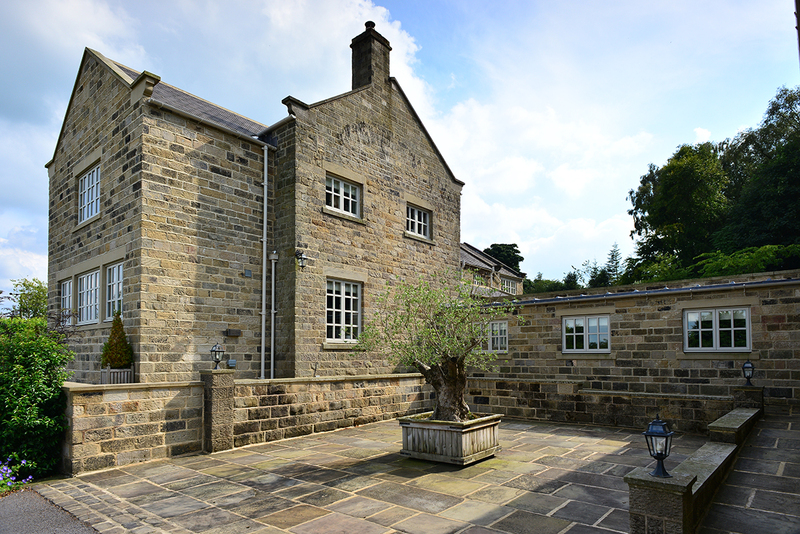 Bowman Riley provided detailed designs and contract administration on the alterations and extensions to a private house in Yorkshire. 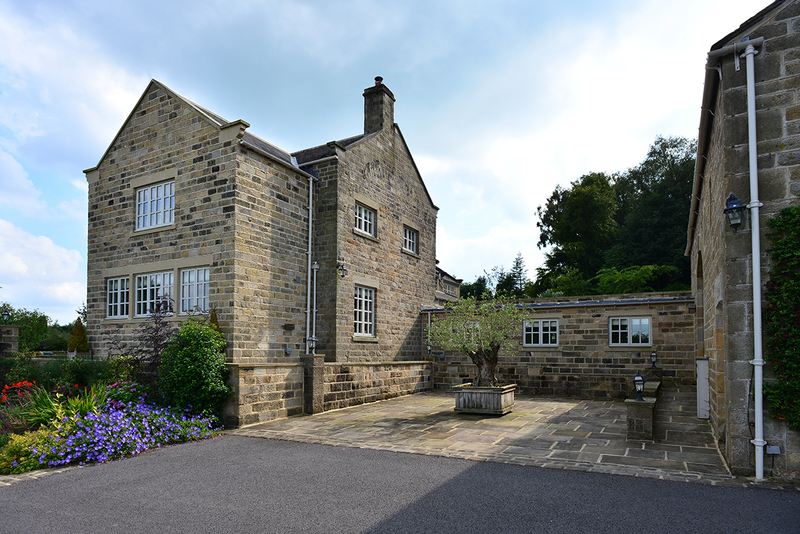 This significant detached five bedroom family home set in extensive grounds commissioned by a wealthy mill owner in 1926. It was originally designed in the contemporary Arts and Crafts style by a local architectural practice but is thought to have been based on a design published by the famous architect Baille Scott. 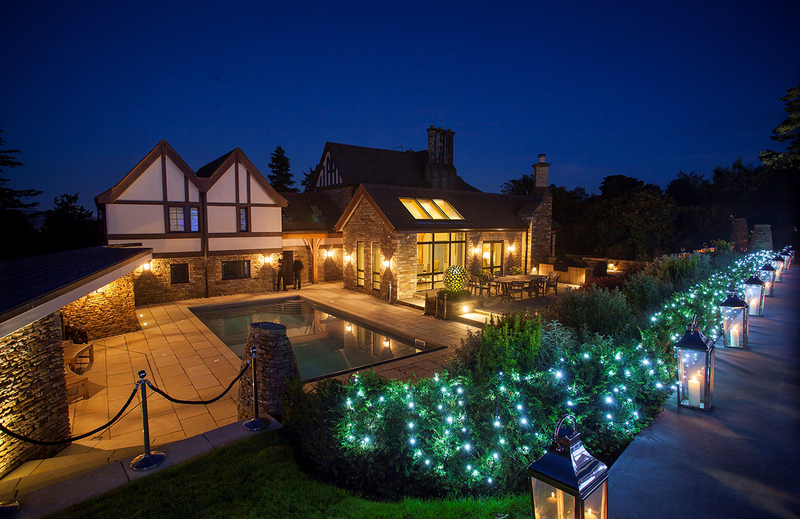 Working alongside three interior designers, our role involved the construction detailing and on-site assistance of significant new build extensions including a new single storey orangery with four exposed oak frames internally and a new two storey double garage with living and bedroom accommodation above. 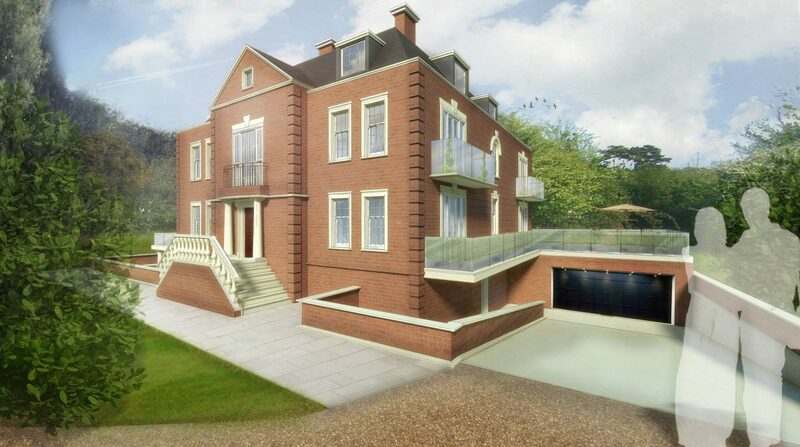 The project involved the replacement of the main entrance porch and a feature double height staircase connecting the existing property and the new extension. 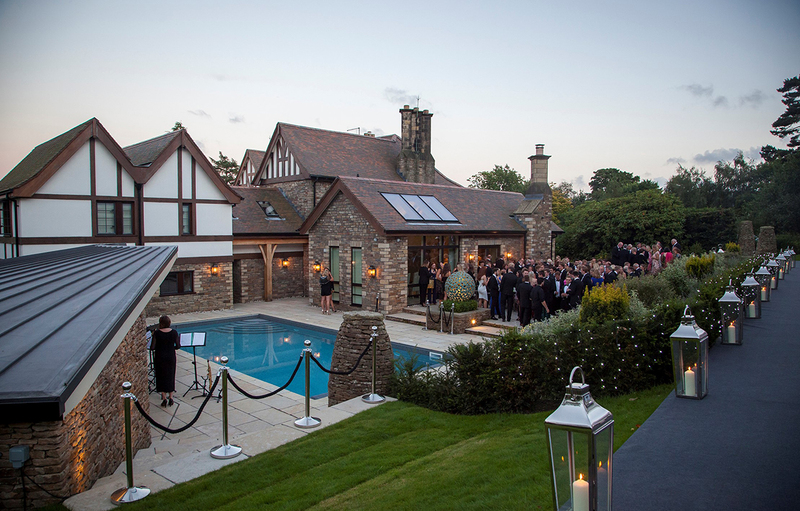 In the grounds, we were involved in the coordination of a 5x10m replacement outdoor swimming pool with terrace areas and plant room contained within a new external curved garden store. 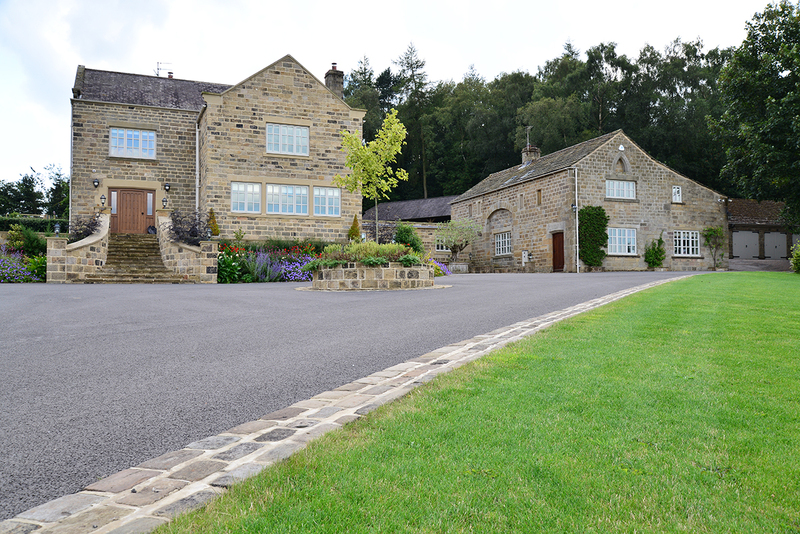 The existing driveway was upgraded throughout and a new front parking courtyard provided. The property retains many original features, including the internal wood panelling to the hall and gallery and the client was keen that new additions were designed in to be in-keeping with existing style. 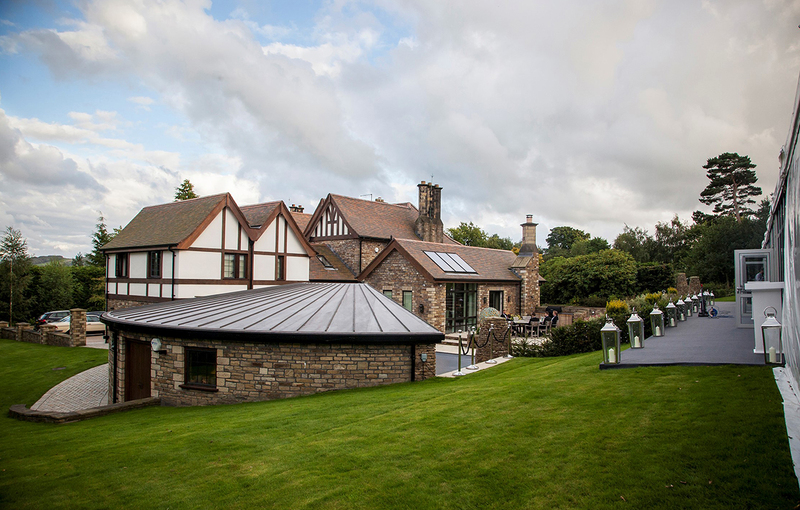 To meet our clients’ expectations and to provide the highest quality extensions and enhancements to their home, specialist and bespoke fixtures and fittings were incorporated throughout including Vale and Velfac windows and the installation of the latest IT system. The works were completed to our clients’ satisfaction. 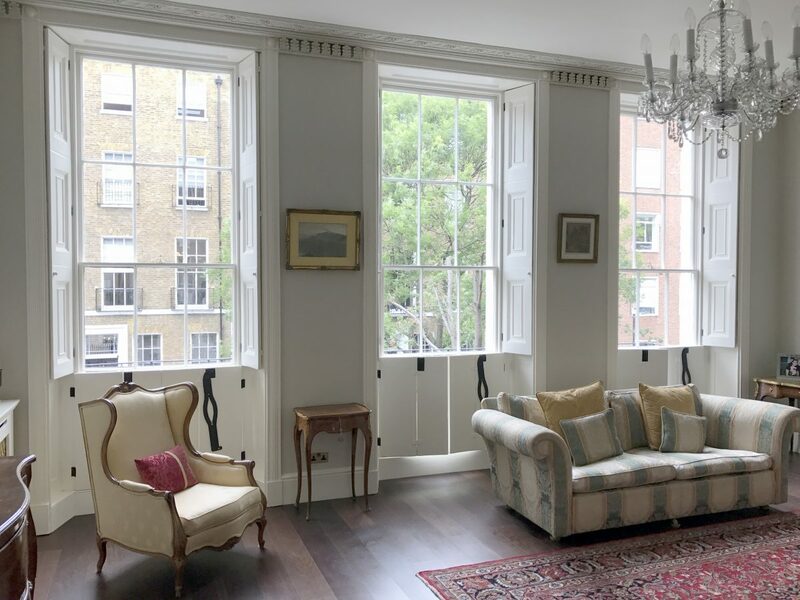 Bowman Riley was appointed to design the refurbishment of a Grade II listed Georgian town house at John Street in the Bloomsbury Conservation Area. Built between 1799 and 1824, 15 John Street is a four storey property including a basement and the centre house of 11 terraced houses. Originally designed and used as a residential property, it had been converted into offices in later years. With planning permission for a change of use secured in 2013, Bowman Riley’s design proposals are to remove a number of added features that remain from its previous office use and to restore it to its original function as a five bedroom family home. The design proposal is to extend the property at the rear and enlarge a light-well, internal alterations, light refurbishment to the elevations and retain key historical features. The character and appearance of the listed building will be maintained and any repairs carried out with the utmost care to maintain any distinctive features. The proposals of the internal layout is to make minor amendments to the house to ensure its suitability for today’s and future use. 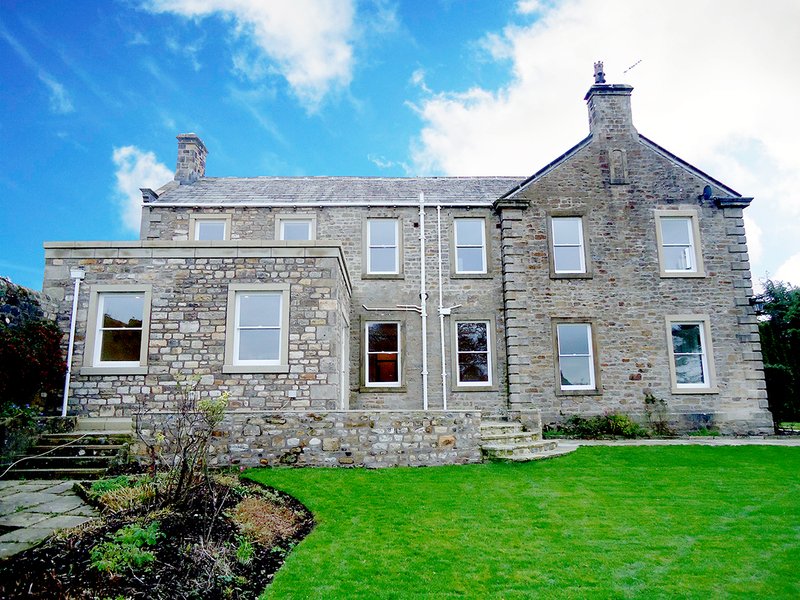 Bowman Riley was commissioned by the new owners of this private house to provide architectural assistance to substantially redevelop their detached family home located within the Yorkshire Dales National Park. We provided feasibility studies, planning, construction and on-site assistance to extend and modernise the 100-year-old five bedroom house. The property was extended to include a new two storey curved main entrance extension with helical oak feature staircase and skylight double height space. 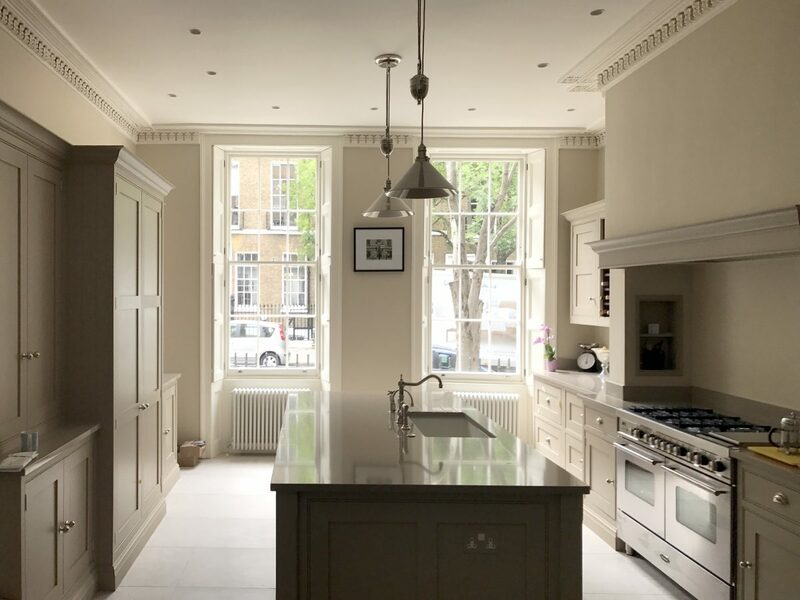 The work also comprised a new single storey kitchen extension and extensive structural works to improve the internal arrangement of the building including modern open plan kitchen and dining area. All the period features were retained including fireplaces, skylight to landing and joinery to openings. 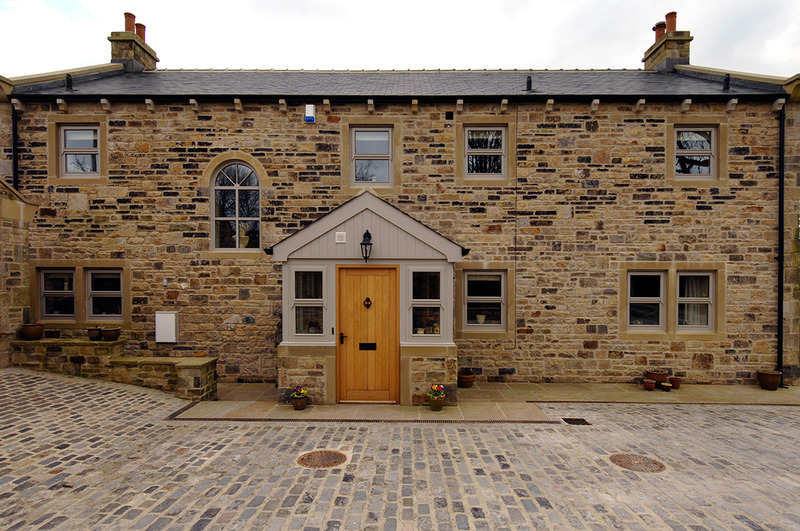 Traditional materials were used throughout the building envelope to match the existing building including natural stone walling with sawn stone door and window surrounds and new sliding sash windows throughout. 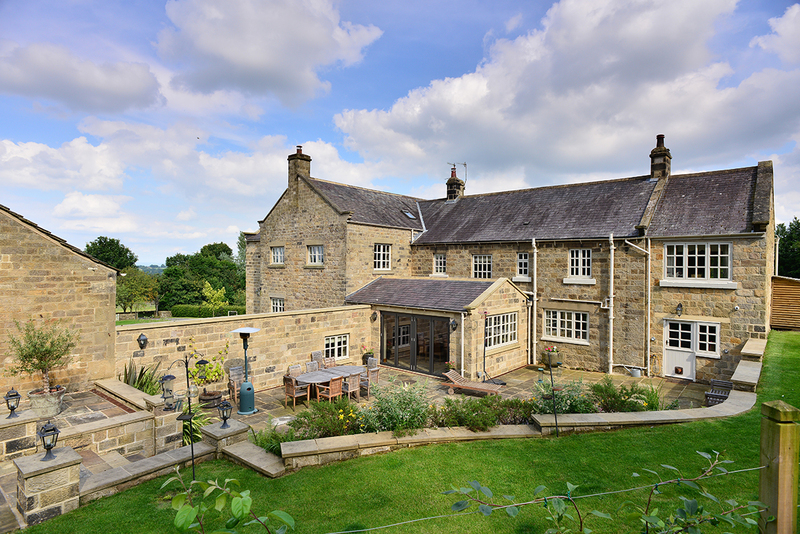 Bowman Riley designed three extensions to a stone built private family house with mullioned windows and a slate roof situated in a tranquil setting above the small village of Birstwith, Harrogate. Originally built as a modest flat roofed house, the property was extended and modified in the late 1990s to create a gabled roof and entrance porch and to convert the outbuilding into domestic accommodation. The current owners wanted to undertake further improvements to get the maximum use out of their family home and to better suit their active and expanding family life. The extensions comprise a single storey covered link between the main house and ancillary accommodation and to extend the main house to allow relocation of the kitchen and provide a new entrance visible on approach to the building. The link provides a safe covered walkway between buildings and creates two courtyards, a public courtyard at the front for guests and a private courtyard at the rear for the family providing a secure area for children to play, now separate from the driveway. A two storey gable extension accommodates a new open plan living/dining/kitchen area with views over the scenic landscape. The ancillary building incorporating a standing seam lead roof and a single storey orangery. Won through competition, Bowman Riley designed a contemporary new build family home and garden in Yorkshire. The brief was to create a contemporary two bedroom home using a palette of stone, timber and glass materials that would have minimal impact on its surroundings. 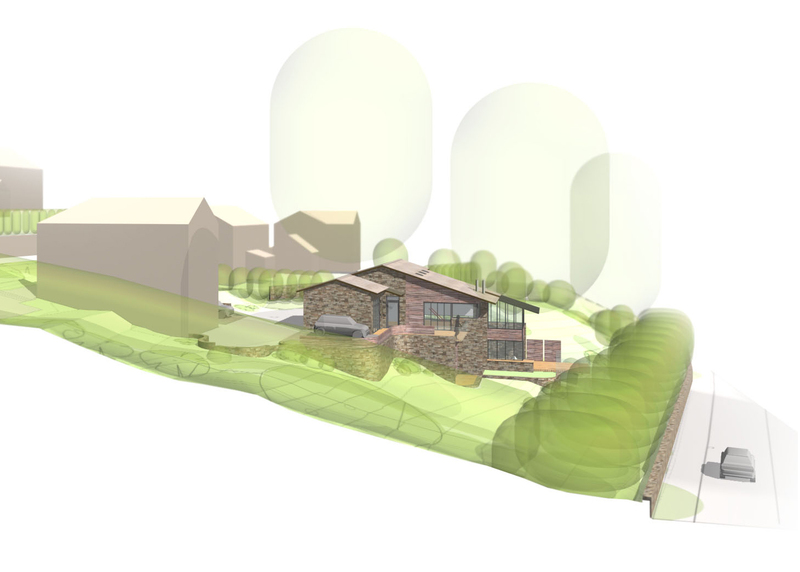 Our concept was to build the property into the hillside to give the appearance of a single storey dwelling when viewed from adjoining properties, with a two storey aspect to the private side. We erected a full-size scaffold model to demonstrate that the new property could not be seen over the existing landscape. The home was created to be highly insulated centred around a wood burning stove heating the space including the mezzanine level. Bowman Riley became involved in the scheme following an initial design by another firm of architects, which was objected to by the neighbours and refused planning permission. 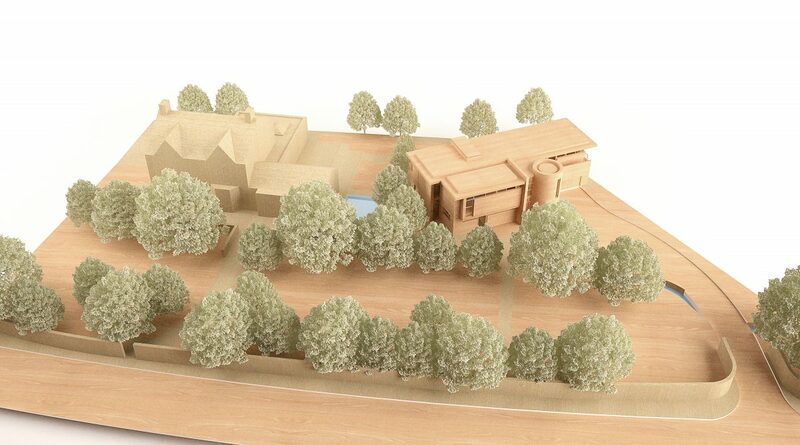 Our design achieved planning consent, however, there is an historic covenant on part of the garden. The client is currently perusing legal avenues to remove the covenant and in the meantime, part of the structure has been erected outside the area to maintain the planning consent.